Laura Petersen, a freelance writer featured in Nevada City’s local newspaper, The Union, recently introduced Inner Path yoga instructor, Mariah Simpson. Simpson, who discovered yoga as a form of emotional and physical therapy, is offering yoga both in and outdoors. “It changed my life,” Simpson recalled. At 17, like many teens, she was “getting into trouble”, so her parents sent her to Hawaii where she attended a two-week intensive program and learned life skills such as organic gardening, meditation and yoga, in the backdrop of nature. Such a serene environment assists in lowering erratic moods, depression, anxiety, and even low self-esteem. It also strengthens the muscles, particularly those of the abdomen and back. This improves posture and breathing which, in turn, improves energy and stress levels. Mindful breathing, movement such as yoga, and meditation – principally in nature – allows people to tune into the feelings and openness that the poses create in the body, Simpson explained. Such an environment can further place things into perspective – one’s “development, beliefs, and outlook on life” – the very benefits that Simpson experienced through yoga. It brings upon calmness, energy, and awareness of the Self. Simpson is certified through Ananda Yoga from the Expanding Light retreat center in Nevada City. Since attaining her yoga teacher training credentials, she has developed a series of “Treks for the Spirit,” outdoor yoga classes for Bear Yuba Land Trust. 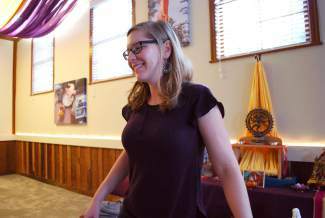 She also recently launched her website and business name, Yuba River Yoga. Mariah Simpson teaches classes from 7:30-8:30am Wednesdays and 8:30-9:30am Saturdays at Inner Path, 200 Commercial St., across the street from Three Forks Bakery and Brewing Co. parking Lot. Her outdoor yoga classes are on Sundays at 11:00am, near the amphitheater in Nevada City’s Pioneer Park. Always wear comfortable, flexible clothing when practicing yoga. Bring water and a yoga mat as well. Outdoor yoga may call for sunglasses, sunscreen, and a towel to assure comfort. For more information, visit Inner Path’s website. The cost for Simpson’s yoga classes are $10. The original article by Laura Peterson, A Changed Life in Nevada City, was featured in The Union on May 9, 2016.